In 1789, when the United States Constitution was adopted, only white males were allowed to vote for representatives. The 15th amendment was passed in 1869, giving men of all races the right to vote. The next group to rise up for their right to vote was the women. Though many smaller organizations existed before this point, the beginning of the Women's Suffrage Movement is traditionally said to be the 1848 Seneca Falls Convention in New York. The movement had grown, but during the Civil War, the Women's Rights movement faded into the background while the nation turned its head to a more pressing issue, slavery. When the reconstruction amendments were passed, granting 'universal suffrage', women pushed to be included, but were denied. As Americans moved West, though, the Women's Suffrage Movement gained ground. Women's suffrage was soon established in the Wyoming Territory, Utah, and the Washington Territory. 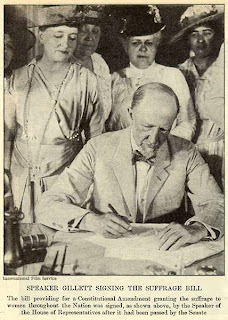 The 19th amendment was originally created by Susan B. Anthony with the help of Elizabeth Cady Stanton, who gave the bill to California Senator Aaron A. Sargent. The bill was first introduced to congress in 1878. The first vote taken on the amendment was taken in 1887, when it failed with a 16 to 34 vote. For the next three decades, the amendment was voted on several times, yet failed each time. In a 1919 vote, the amendment failed by only one vote. The bill was brought back to vote on May 19th, 1919, where it passed with 42 more votes than necessary. The amendment was then sent to the states to be ratified. Wisconsin, Illinois, and Michigan were the first states to ratify the amendment, doing so on June 10th, 1919. Over the next year, the other states began to ratify the amendment. On August 18th, 1920, Tennessee was the 36th of 48 states to ratify the amendment, giving the amendment the two-thirds majority it needed to become part of the U.S. Constitution. On August 26th, 2013, the Secretary of State proclaimed the 19th Amendment of the United States, giving women the right to vote in America.